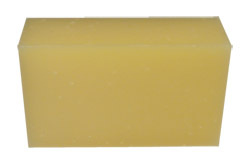 Our luscious, exquisitely naked, unscented soap… because sometimes you just want Simplicity™! Your quest for the perfect bar of soap is over! Just the right balance of natural soapy goodness to keep your skin’s soft, supple, healthy glow from your head to your toes! Choosing a pure bar soap nourishes your body from the outside, while protecting it from the elements. It’s liquid nutrition that won’t strip your skin like detergent cleansers, and you need it because your skin is the largest organ of your body. Keep it hydrated, healthy, and happy, and you’ll feel the difference! Saponified oils of safflower* and/or sunflower*, palm*, and coconut* (with retained glycerin).